Shepperton railway station offers direct services into London Waterloo. There are bus services to Walton-on-Thames, Chertsey, Woking, Staines, Kingston and beyond. 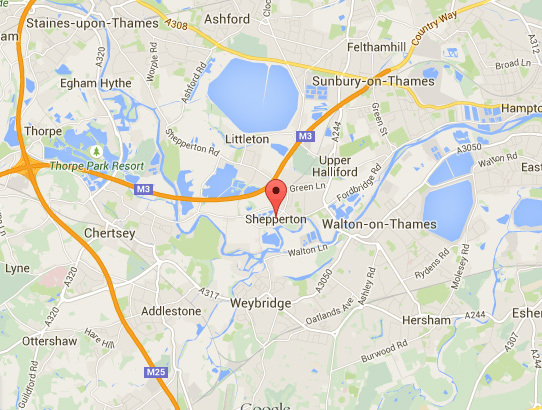 Shepperton is ideally located for access to both the M3 and M25 motorways as well as the A316 into West London. Heathrow Airport and Hatton Cross underground station are within 7 miles. Shepperton has its own Health Centre, two dentists, two opticians and a chiropractor. There are many well supported local events over the year. Shepperton Village Fair, traditionally held on the second Saturday in June attracts thousands of people not only from Shepperton but from all around the local area. There are numerous stalls, childrens rides, a bar, food outlets, craft tent and the famous ‘raft race’. The other major event in the calendar is “Big Tree Night” which is held during the lead-up to Christmas. There is carol singing, food, stalls and most importantly santa pays a visit. Many of the world’s most profitable and best‐loved films have been made at Shepperton Studios. Often described as the home of independent film production, it continues to attract some of the world’s most revolutionary and inspirational filmmakers. Many television shows and specials are also made here. The residents of Shepperton are rightly proud of the High Street as it not only offers a wide range of shops and services but it has retained its ‘village feel’. There are two supermarkets, a sports shop, post office, petrol station, two green-grocers, a butchers, a bakers, two banks, a mini-cab company, three chemists, three newsagents, a wedding shop, three florists, a womens fashion shop, two vets, a hardware store, a card shop, a stationers, two beauty salons, six hairdressers, a bathroom showroom, two double glazing showrooms, a prestige car showroom, a launderette, two dry-cleaners, a travel agent, a motor spare shops, a computer shop, post office, Royal Mail sorting office, carpet shop and a key cutting outlet. There is also the Village Hall, library, various charity shops, several cafes along with four Indian restaurants, one Chinese restaurant, one Chinese takeaway and one Italian style restaurant. The historic Church Square area comes alive in the evening with The Anchor and Warren Lodge hotels, The Kings Head public house and two popular restaurants, Edwins and Blubeckers. To the bottom of Ferry Lane is the Towpath with the picturesque Shepperton Lock and its own little cafe and the Thames Court restaurant and pub just a couple of hundred yards away. Nauticalia Chandlers is also situated close to the lock.